Ph.D. in Chemistry is a 3-year doctorate course in chemistry. The candidates who are willing to take up this course must have the minimum eligibility by completing their master’s degree and M.Phil. in some subjects is the prerequisite for this course. The average course fee charged for this course is between INR 60 k – 4 Lacs for the span of 3 years. Admission process of Ph.D. in Chemistry course is carried out based on the candidate’s performance in their high school exams. Some institutes may include their entrance exam score. Chemistry is the study of science of matter, likely its properties, structure, composition, behavior, reaction, interaction and its changes that it undergo. 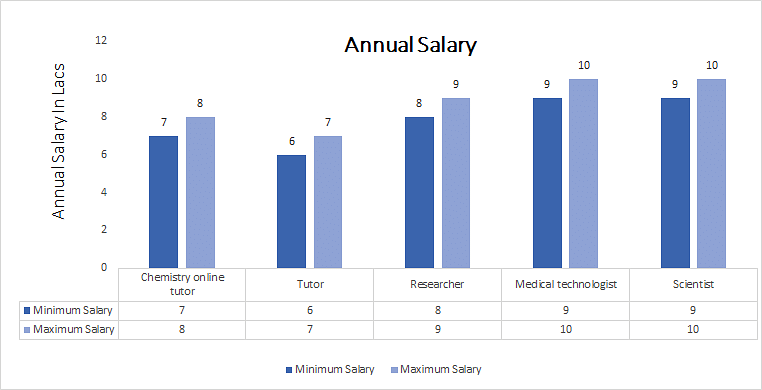 The candidates who are willing to promote their academic career and hike in salary and stabilized job can do Ph.D. in Chemistry course. But the candidate should be capable of having good analytical and problem-solving skills such as examining and interpreting results and making evaluations based on limited information. The similar skills set required for the candidate are like planning, executing the experiment, undertaking project works. There are wide career opportunities in the employment areas like environment consultancies, forensic science labs, pharma companies, etc. there are also a variety of job positions available. Top Recruiting Companies Chemical Industries, Food Industries, Chemical Research Organizations, etc. Job Positions Staff scientist, chemistry instructor, tutor, teacher, etc. Ph.D. in Chemistry: What is it about? Chemistry is sometimes called as ‘the central science’ because it connects the physics with other natural sciences such as astronomy, geology and biology. On completion of this doctorate degree they must submit their ‘thesis’. Doctorate degree enables one to keep expanding frontiers of knowledge and provides research training relevant to the present social and economic objectives. The doctorate degree course teaches to write a good research report and acquires the skill of presenting data in graphical form. Also there are good jobs available in food and drinking industries, utilities and energy research, health and medical organizations, scientific research organizations and agencies. The candidates who have completed M.Phil. in science as their major discipline with at last minimum aggregate marks obtained in their exams are eligible for this course. Some institutions consider the score in the entrance tests based on the subjects covered. Admission process for Ph.D. in Chemistry is carried over by considering the merit score of the student in their exams and some institutes conduct entrance exams and there would be personal interview carried by the institute that various or depends up on the institutes. On successful completion of Ph.D. in Chemistry course the candidates are applicable of working in the wide range of employment areas like chemical research organizations, chemical industries, research foundation, universities and colleges, plastic and polymer Industries, educational institutes, forensic labs, food industry, drinking and beverages industries, scientific research organizations, etc. There are also wide features job types like staff scientist, part-time chemistry instructor, medical technologist, tutor, teacher, etc.